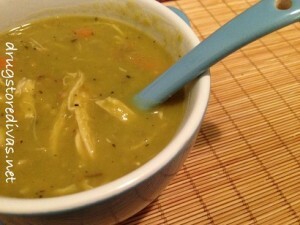 Mamas, it is BITTERLY cold outside today and we LOVE this recipe from Drug Store Divas for Spilt Pea Soup! Heat butter in a large Dutch oven over medium-high heat. When foaming subsides, brown meat on each side [[about 3 to 5 mins per side if you’re using turkey]]. We used chicken because that’s what I like. Remove the meat. Add chopped bacon and cook till brown and crispy. Add onion and half teaspoon salt. Cook, stirring frequently, until softened, about 3 to 4 minutes. Add garlic and cook about 30 seconds. Add water, meat, peas, Italian seasoning, and bay leaves. Increase heat to high and bring to simmer, stirring frequently to keep peas from sticking to bottom. Reduce heat to low, cover, and simmer until peas are tender but not falling apart, about 45 minutes. Remove meat, cover with foil or plastic wrap to prevent drying out, and set aside. Stir in carrots and celery. Continue to simmer, covered, until vegetables are tender and peas have almost completely broken down, about 30 minutes. When cool enough to handle, shred meat into bite-size pieces. Remove and discard bay leaves. Stir meat into soup and return to simmer. Season to taste with salt and pepper. Serve with toasted bread or croutons. Enjoy.Adapted from America’s Test Kitchen. Thank you Drug Store Divas for such a tasty lunch!!!! MMM . . . Monday, INDEED!